Royal Caribbean had two giant events today in France. 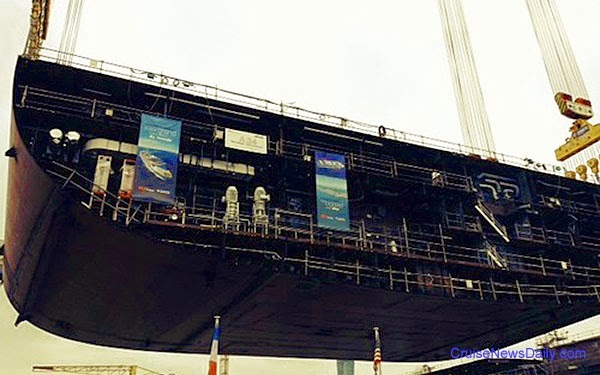 First STX France laid the keel for the line’s as-yet-unnamed third Oasis-class ship. That was one event. 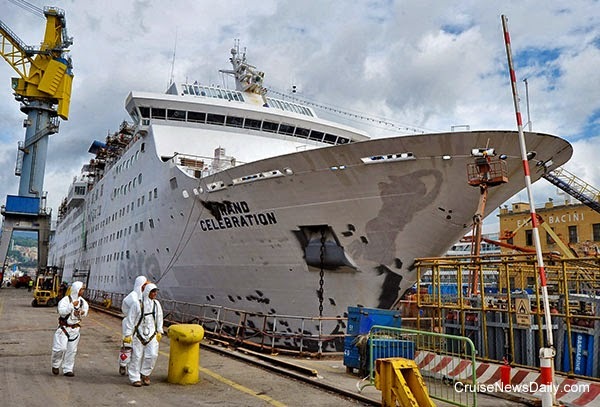 At that ceremony, the second event occurred when Royal Caribbean announced they have agreed to build a fourth Oasis-class ship with STX France, subject to the normal financing terms being finalized. A marvelous day has come and gone in Southampton, and the tenth anniversary of Queen Mary 2 has been duly noted in royal style. 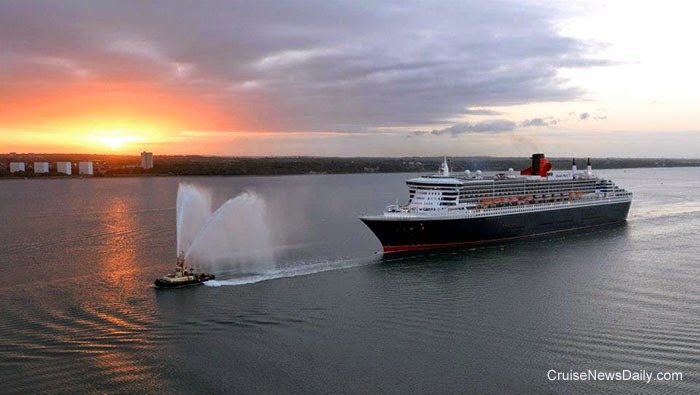 To mark the occasion, Cunard’s entire fleet assembled at Southampton to salute the flagship, and there was a royal visit to Queen Mary 2 by HRH the Duke of Edinburgh. 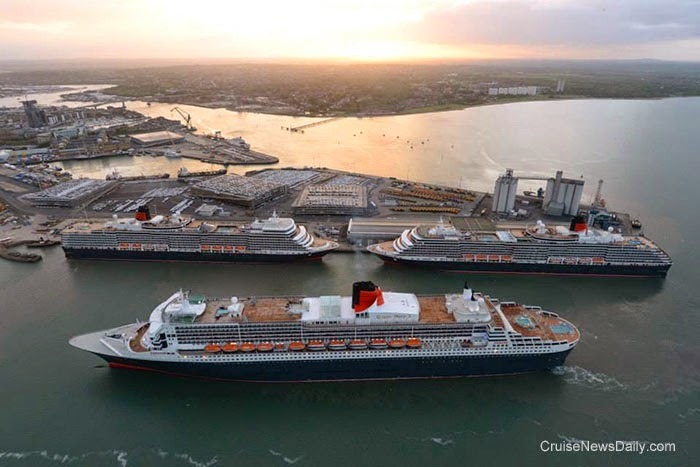 It was a special day in Southampton because all three of Cunard's queens visited the city to mark the occasion of the tenth anniversary of Queen Mary 2. 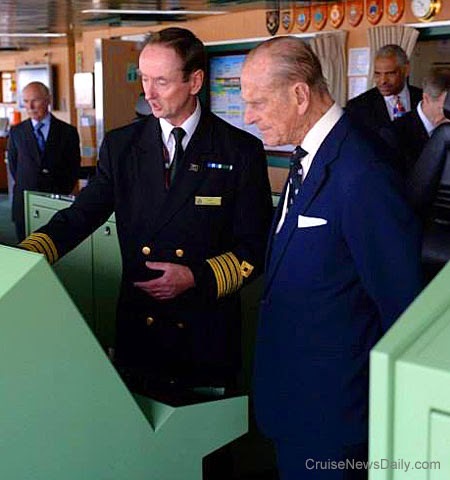 As part of the celebration, HRH Prince Philip, the Duke of Edinburgh visited Queen Mary 2. 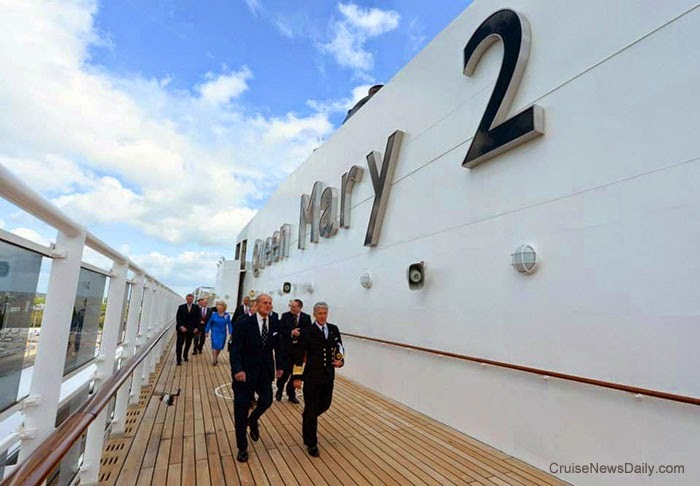 HRH Prince Philip, the Duke of Edinburgh, visited Queen Mary 2 to mark the occasion. Royal Cruises Ltd said today they will order a fourth Oasis-class ship from STX France, subject to finalization of financial arrangements. The ship is scheduled for delivery in 2018. The announcement came this morning at the keel laying for the third Oasis-class ship at the STX yard in Saint Nazaire (France). Holland America is returning to Bermuda next year, but differently from everybody else. CND subscribers also read about Carnival Dream rescuing 39 people ... nice to see an old friend ... sounding familiar ... and the trouble with sponsons. 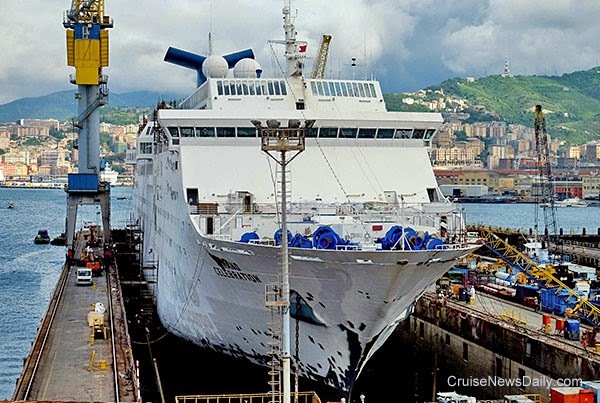 The 47,263-ton ship is currently at the San Giorgio del Porto shipyard in Genoa, as shown below, for its routine dry dock where maintenance work will be done on the hull, the engine and the hotel areas. Grand Celebration will be back in service with a repositioning cruise from Valencia to Venice on May 18, 2014. Update - May 12: In April 2015, Grand Celebration will be transferred to the Costa brand and sail from Venice and renamed CostaCelebration. Photos courtesy of Costa Crociere. All rights reserved. May not be copied or used without permission. Carnival Offers a Day's Vacation to Houston Offices - for 100 people!! MIAMI (May 8, 2014) –Carnival Cruise Lines, Texas’ largest cruise operator, and CBS Radio Houston are searching for the most spirited office in Houston for the chance to win the Ultimate Summer Office Party – a day of vacation-inspired fun for up to 100 people aboard one of Carnival’s Galveston-based cruise ships. Through a fun and easy photo contest conducted by Carnival and four leading Houston radio stations, those working for local companies in the greater Houston area can enter by submitting a new “vacation-ready” photo with their colleagues until May 23, 2014. The grand prize winner will be announced the week of May 26. The winning submission will receive the Ultimate Summer Office Party for up to 100 people aboard one of Carnival’s ships on a turnaround day at the Port of Galveston. It will be a day that’s all play and no work for guests on board who can ride the waterslide, enjoy the pools and open decks, feast on a variety of delicious foods and cocktails with their colleagues. Carnival pioneered year-round cruising from Galveston, Texas and currently operates two Galveston-based ships carrying more than 450,000 passengers annually – more than any other cruise operator. Carnival Magic offers seven-day Caribbean cruises and Carnival Triumph features four- and five-day departures to Mexico. The line will expand its operations in Galveston next year when Carnival Freedom launches seven-day sailings to the Caribbean in February 2015, marking the first time that a cruise line has deployed three year-round ships in Texas. These ships feature a wide variety of innovations that are part of the line’s Fun Ship 2.0 product enhancement program, including the Caribbean-themed RedFrog Pub, Guy’s Burger Joint developed in tandem with Food Network star Guy Fieri, and the Punchliner Comedy Club presented by George Lopez, along with spectacular water slides, miniature golf courses and other exciting top-deck attractions (features vary by ship). Royal Caribbean said today that beginning with the 2015-2016 season, the 70,000-ton Legend of the Seas would be homeported at Singapore during the winters and at Brisbane in the winters (summer there). Until now, the Carnival brand has offered a similar type of product in Australia to what they have in North America: round trip itineraries in a length to fit vacation length of the market. Now as it becomes necessary to move ships around, they are going to try the Carnival style of onboard product with longer fly/cruise programs - a type of cruise that, in North America, appeals primarily to the line’s most ardent fans. Carnival Cruise Lines has announced its latest Australian ship Carnival Legend will sail the warm waters of the Pacific to Hawaii next year, while Carnival Spirit will make the cruise line’s first ever visit to Asia on an exotic voyage from Sydney to Singapore. The inaugural fly-cruise itineraries will give Australians an exciting new way to visit two popular holiday destinations, while enjoying all the fun of a Carnival cruise on the way. Fares start from $1049* per person quad share for Carnival Spirit’s 15-day Sydney to Singapore cruise departing August 1, 2015 and including visits to Lombok and Bali in Indonesia and Brisbane, the Whitsundays and Darwin. Meanwhile, holidaymakers keen to fly to Singapore and sail home can choose the ship’s 15-day cruise from Singapore to Sydney, departing August 30th, 2015 and also priced from $1049* per person quad share. The new cruises will give Queenslanders their first chance to experience Carnival Spirit sailing from Brisbane, with the cruise line offering a 13-day sailing from Brisbane to Singapore on August 3 as well as the return voyage departing Singapore on August 30th, with fares from $1049* per person quad share. Australians will also be able take in all the onboard entertainment and excitement of the cruise line’s latest ship, Carnival Legend, as she sails across the Pacific to Hawaii in April next year. Cruising from Sydney on April 20, the 18-day cruise will visit Fiji and beautiful Bora Bora, Moorea and Papeete in Tahiti before heading to Honolulu. Fares start from $1329* per person quad share. The cruise line is also offering the chance to enjoy a spring sailing from Honolulu to Sydney via Tahiti and Fiji in September 2015 as Carnival Legend returns to Australia for its second summer season. Fares on the 18-day cruise leaving Hawaii on September 26, 2015 start from $1399* per person quad share. The Singapore cruises are now open for sale in Polar, with travel agents advised of the new Carnival Spirit itineraries, which will replace existing South Pacific schedules. Carnival Spirit’s visit to Singapore will enable her to undergo a two-week refurbishment and upgrade before her return to Australian waters. The Hawaii cruises will go on sale May 7. Carnival Cruise Lines Vice President Australia Jennifer Vandekreeke said the new cruises would give Australians a great way to travel to Asia and Hawaii. “We’re excited to be able to offer our guests these longer itineraries which are perfect for travellers looking to visit some wonderful tropical destinations which are a bit further from home, while enjoying all Carnival has to offer onboard,” Ms Vandekreeke said. As with all the cruises on Spirit and Legend departing from Australia, the cruises to and from Singapore and Honolulu will operate in Australian dollars and feature entertainment and food designed for Australian tastes, with no tipping required. Both Carnival Legend and Carnival Spirit offer 12 decks packed with plenty of activities as well as relaxation options, including four restaurants, 16 bars and lounges, two theatres, a spa and gym and the wonderful Serenity child-free retreat. MIAMI, May 7, 2014 -- The Board of Directors of Royal Caribbean Cruises Ltd. (NYSE, OSE: RCL) today declared a quarterly dividend of $0.25 per share payable on June 5, 2014, to shareholders of record at the close of business on May 20, 2014. Royal Caribbean Cruises Ltd. (NYSE, OSE: RCL) is a global cruise vacation company that owns Royal Caribbean International, Celebrity Cruises, Pullmantur, Azamara Club Cruises and CDF Croisieres de France, as well as TUI Cruises through a 50 percent joint venture. Together, these six brands operate a combined total of 41 ships with an additional six under construction contracts. They operate diverse itineraries around the world that call on approximately 490 destinations on all seven continents. MIAMI, May 7, 2014 – Royal Caribbean International today announced Legend of the Seas’ year-round deployment for 2015-16, offering itineraries to breathtakingly beautiful destinations throughout Southeast Asia from Singapore in the summer season, and sailings to idyllic settings in Australia and the South Pacific during the winter season from the cruise line’s new homeport of Brisbane, Australia. With Mariner of the Seas’ also sailing from Singapore in the winter season, Legend of the Seas’ new summer season will mark the first time that the cruise line will offer year-round sailings from Singapore. Additionally, Legend of the Seas will join Explorer of the Seas, Voyager of the Seas and Radiance of the Seas to total a record deployment of four Royal Caribbean ships in Australia. Legend of the Seas 2015-16 Southeast Asia, Australia and South Pacific cruises will open for sale on May 21, 2014. Legend of the Seas will begin its 2015 summer with a 15-night Westbound Panama Canal crossing, departing in April from Port Everglades in Fort Lauderdale, Fla. to San Diego, Calif. From there, the ship will embark on a trio of sailings across the Pacific to Singapore. A 10-night Hawaii cruise from Ensenada, Mexico, will take guests to the islands of Maui, Kauai, and Hawaii – with a cruise by the world famous and still-very active Kilauea Volcano – and conclude at Honolulu, Oahu. From there, Legend of the Seas will sail a 17-night itinerary to Sydney, Australia, via the French Polynesian islands, Fiji and New Caledonia. The ship will then complete its half-way-around-the-world voyage to Singapore via the north coast of Australia. While homeported in Singapore, Legend of the Seas will sail a variety of three- to 10-night roundtrip itineraries throughout Malaysia, Thailand, Cambodia and Vietnam through mid-November. Vacationers also can choose among two consecutive 14-night itineraries in September, a southbound sailing from Singapore to Perth (Fremantle), Australia, followed by a northbound return, both taking guests to Malaysia, Thailand, Indonesia, and Western Australia. Legend of the Seas will then transition from Singapore to its new homeport of Brisbane on an 18-night itinerary, departing in late November. During the cruise line’s first season sailing from the Australian city, vacationers can choose among a wide range of eight- to 11-night, round-trip itineraries that take them to Vanuatu, New Caledonia, Loyalty Islands and Fiji in the South Pacific. The ship also will offer seven-night Queensland sailings which feature an overnight at Cairns. Additionally, a 14-night New Zealand itinerary will take guests to Auckland, Tauranga, Napier, Wellington, Akaroa, and Dunedin, as well as cruise Dusky, Doubtful, and Milford sounds. Recently having undergone an extensive revitalization, Legend of the Seas offers guests seven delicious dining options, including the cruise line’s signature Chops Grille steakhouse, Izumi Asian Cuisine, Park Café gourmet deli, and the exclusive Chef’s Table, a multi-course dining and wine-pairing experience hosted by the executive chef and sommelier. Most exciting has been the addition of the Centrum aerial-acrobatic extravaganza, making the ship’s central five-deck atrium an unexpectedly spectacular entertainment venue. Every stateroom and bathroom also have been renewed and new ship-wide technology enhancements, such as an oversized LED movie screen poolside, digital signage at elevator lobbies, flat-panel televisions in staterooms, and bow-to-stern WiFi service, help offer guests the most contemporary vacation experience. Suite guests and the most loyal Crown & Anchors Society members also respectively enjoy exclusive access to the new Concierge Club and Diamond Club lounges, while the youngest guests – age six- to 36-month old – can rest soundly in the ship’s new Royal Babies & Tots Nursery. 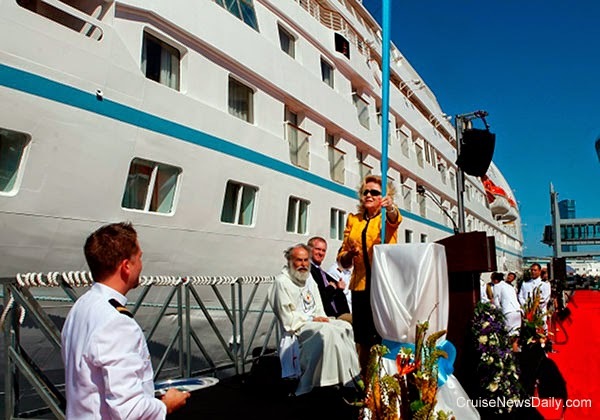 Throughout, guests will enjoy Royal Caribbean’s world-renowned friendly and engaging GOLD Anchor Service. AIDAluna completed a ten-day dry dock yesterday when it left the Blohm+Voss yard at Hamburg. The dry dock was its regular maintenance visit, but it included one special project. The ship had the first portion of a comprehensive exhaust filter system installed. CND subscribers also read about a disappointment ... work continuing on Costa Concordia ... and a glass act. 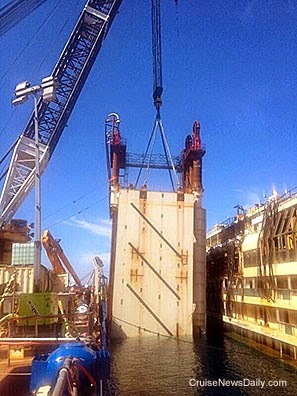 While the installation of the third sponson (the giant floats being attached to each side of Costa Concordia) since work resumed this spring doesn't have any particular significance, it did afford us an opportunity to appreciate the size of the project. The top photo, taken yesterday, shows sponson S-11 is being held next to the side of the ship. The ship is to the right of the picture, and the crane barge is on the left. Note that the sponson is over six decks high and some of it is already under the water. 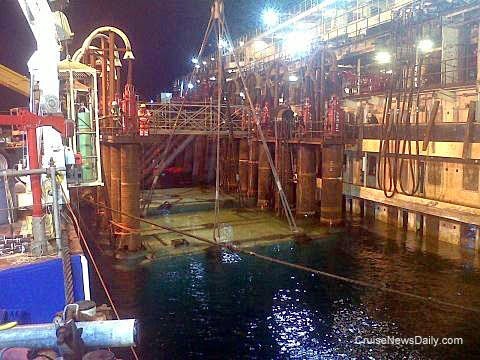 In the bottom photo, the sponson is in position for attachment to the ship last night. You can see the top of the sponson being held by the crane just under the surface of the water. 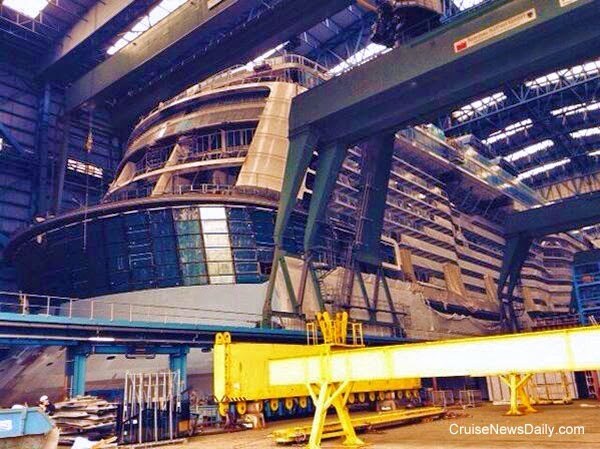 The side of the ship is again visible to the right with the top five decks above the water. More than 120 divers are working in shifts 24-7 to complete the job as soon as possible. Photos courtesy of Titan Micoperi. All rights reserved. May not be copied or used without express permission. Rostock , 06 May 2014 - Dr. Ali Arnaout (45) joined May 5, 2014 new CFO & SVP Business Development, the management team of AIDA Cruises. He thus succeeded as CFO Paul Soulsby on, who has worked since January 2014 as Senior Vice President of Shared Services for the Costa group in Genoa. Dr. Arnaout henceforth bears the responsibility for Finance, Controlling, Legal, Business Development at Germany's leading cruise line. In his new responsibilities in the Rostock corporate headquarters, he reports directly to Michael Ungerer, President of AIDA Cruises. "I am pleased that we can welcome a proven financial expert on board at AIDA with Dr. Arnaout. Due to his wide national and international experience, he will be an important contributor to our continued successful growth and expansion of our business,"said AIDA President Michael Ungerer. Arnaout holds a doctorate in business administration. Before joining AIDA Cruises as CEO at the top of Engel & Völkers Capital AG. His professional career is closely connected to the MPC Group where he became active as the Managing Director of MPC Münchmeyer Real Estate Consulting GmbH as well as an officer and member of the Group Management Board of MPC Capital AG. AIDA Cruises has ten ships, Germany's leading provider of cruises to worldwide more than 180 destinations. By 2016 the AIDA fleet will grow to twelve ships. The company currently employs 6,900 people on board its fleet as well as to the company's sites in Rostock and Hamburg. Norwegian Breakaway was delayed returning to New York on Sunday because it spent several hours sitting in the Hudson River. It was a minor story, but due to lack of information, it seems the news media made it into a larger one. 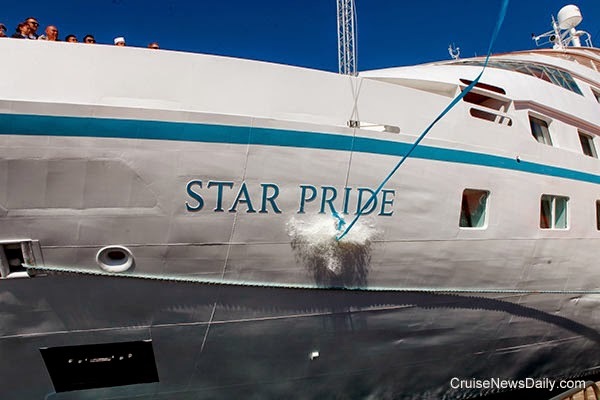 The latest addition to Windstar's fleet, Star Pride, was christened today in Barcelona by its godmother, Mrs. Nancy Anschultz, the wife of Philip Anschultz, the owner of Windstar's parent company.